The Paris Agreement outlines results-based finance which is a cornerstone to the implementation of REDD+ in the tropics. Many tropical countries have developed national REDD+ strategies and are seriously considering their potential to contributing to the mitigation of climate change in the context of NDCs under the Paris Agreement. United Nations Climate Change Conference COP22_CMP12 (Side Event) organized by BC3 “Sustainable development priorities of highly sensitive regions to Climate Change in Latin America: Appropriate orchestration of Adaptation and Mitigation actions” Since 2010 BC3 has been playing an active role at COPs with a variety of contributions. 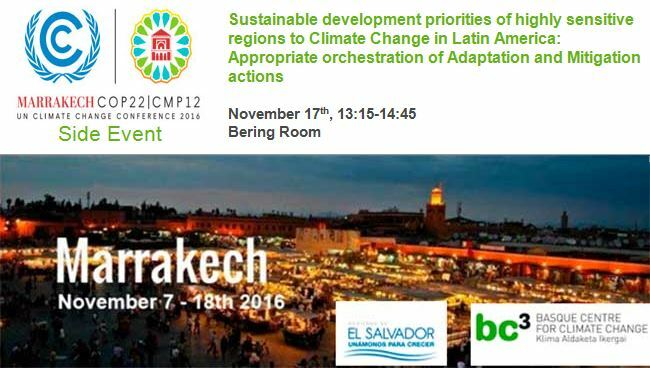 This year, 2016 BC3 will be contributing to different Side Events at COP22 (see full BC3 Agenda at COP22 here) and has organized its own Side Event jointly with the Government of El Salvador with the objetive of Transfering Knowledge and promoting implementation. American crude oil prices have dropped significantly of late up to a low of less than $30 a barrel in early 2016. At the same time price volatility has increased and crude in storage has reached record amounts in America. Low oil prices in particular pose quite a challenge for the survival of America’s tight-oil industry.